Krishna Janmasthami is an annual hindu festival celebrates the birth of Krishna , the eighth incarnation of Lord Vishnu. People celebrate Janmasthami by fasting, singing, praying together, visiting krishna or vishnu temples and sharing special food. But what if you don’t live near a temple. It can be celebrated anywhere. 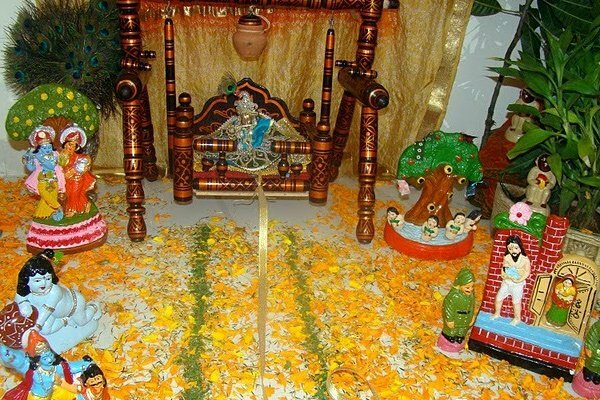 There are some tips to celebrate Krishna Janmasthami at Home. -> Invite your friends and family. Decorate your home. Make garlands and hanging baloons. -> Choose some of your favorite bhajans to sing. Sing and play instruments with your friends or you can also play bhajan CD’s enhance spiritual atmosphere. -> Read the story of Krishna or Srimad Bhagwatgita. Janmasthami is all about involving yourself in thoughts of Krishna in a festive way. -> If you have Radha Krishna idols, bath it with milk, honey and water and dressed them in new cloths. -> Devotees put a list of 56 items of Krishna’s favorite dishes in temples which is referred as Chappan Bhog and later it will be distributed among the people after fast. Some of the common dishes found in Bhog are jalebi, makhan mishri, dahi, cashews, khichadi. You don’t have to go for that unless you feel like. Prepare dishes accordingly. -> Have a mid night aarti with a kirtan. If you have aarti paraphernalia then you can do a full offering otherwise offer whatever you can. The only thing matters is your love and affection. -> If you are able to fast from then it is great otherwise try to eat only light food during the day. -> Create a festive mood by dressing childrens in Radha and Krishna getup. -> Enjoy your day with family and friends.